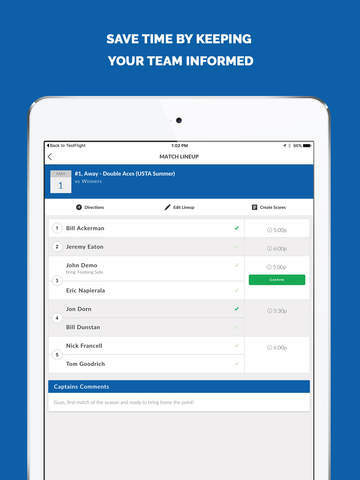 Managing your tennis team just got even easier with TennisPoint's mobile app. Your tennis team's schedule, match lineups, availability and match location are all now within quick and easy reach. * Match Confirmation -- Captains get piece of mind knowing their players will be at the match, since players can confirm for their lineup in the app. * Captain's Features -- you can view draft lineups, text/call opponent captains and view all the "brings" for your players in a lineup. We are working on an updated version to create/edit the lineup and enter scores. Incredibly easy to use! Managing your tennis team couldn't be simpler! Your mobile device must have at least 8.28 MB of space to download and install TennisPoint app. TennisPoint is FREE to download. Hurry up to get this app for free! If you have any problems with installation or in-app purchase, found bugs, questions, comments about this application, you can visit the official website of TennisPoint.com Inc at http://www.tennispoint.com. Copyright © 2012 TennisPoint.com Inc.